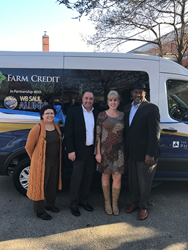 Local agricultural lender, MidAtlantic Farm Credit, donated a ten passenger van to the FFA program at Walter B. Saul High School in Philadelphia, Pennsylvania. Tom Truitt, CEO of MidAtlantic Farm Credit, was joined by Barbara Strain, representative of the W.B. Saul High School alumni, State Representative Pam DeLissio, and Congressman Dwight Evans. MidAtlantic Farm Credit donated a custom-wrapped vehicle to the FFA program at Walter B. Saul High School, located in Philadelphia, Pennsylvania. The high school, whose main focus is on agricultural studies, has one of the largest FFA chapters in the country. A dedication ceremony for the custom-wrapped ten passenger van was held at the high school on November 27. In attendance were Congressman Dwight Evans; State Representative Pam DeLissio; Scott Sheeley, special assistant for workforce development with the Pennsylvania Department of Agriculture; MidAtlantic Farm Credit CEO Tom Truitt; MidAtlantic Farm Credit director Dale Hershey; MidAtlantic Farm Credit’s government affairs officer Kurt Fuchs; MidAtlantic Farm Credit’s regional lending manager, Darin Miller; and Walter B. Saul High School students and faculty members. For more information about Walter B. Saul High School, please visit https://saul.philasd.org/.